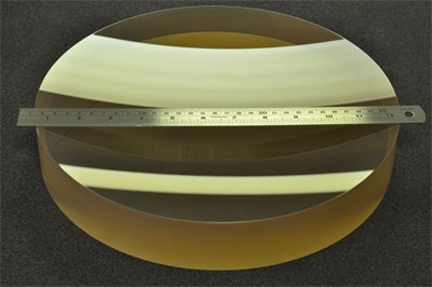 [SatNews] Generations of customers have benefited from incorporating high precision on-axis parabolic mirrors from Optical Surfaces Ltd. into their optical systems. With a heritage stretching back more than 50 years, to the production of large astronomical telescope optics in excess of 1 meter diameter, Optical Surfaces is recognized as one of the world's leading producers of on-axis paraboloids for applications in astronomy and high energy physics. Using proprietary production techniques and benefiting from an ultra-stable production environment, Optical Surfaces highly experienced and skilled engineers can, depending on the surface accuracy required, generate very fast focusing on-axis parabolic mirrors ( < f 0.7). In comparison to an off-axis mirror design, the f-number achievable with an on-axis parabolic mirror is higher therefore more energy can be concentrated. Other advantages of on-axis parabolic mirrors are that generally, alignment is less critical, thus easier and for the same apparent f-number an on-axis parabolic mirror will be less expensive. On-axis parabolic mirrors are especially suitable for broadband or multiple wavelength applications due to their completely achromatic performance. A range of coatings is available from Optical Surfaces including metallic (with or without protective overcoat), multilayer dielectric and ultra hard coatings for high-power lasers. Optical Surfaces Ltd has been producing optical components and systems for more than 50 years and is now accepted as one of the world's leading manufacturers of high precision on- and off-axis parabolic mirrors. The company is also a leading designer and supplier of high precision, ground telescope and satellite-based space observation optics operating over the entire spectral range from infrared to x-ray wavelengths. Production approved to ISO 9001-2000, the quality and performance of large diameter durable high power laser mirrors from Optical Surfaces Ltd. is second to none.